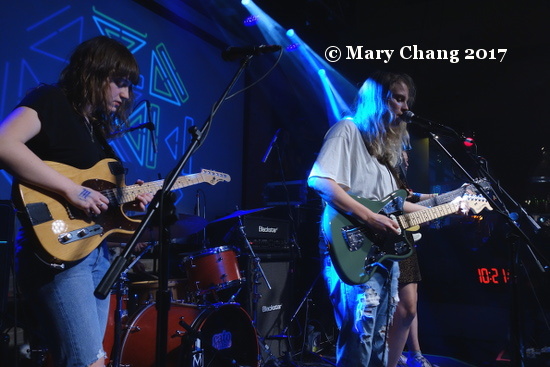 I saw Marika Hackman enjoying the music at the British Music Embassy that afternoon. She recognised me from when I interviewed her 2 years ago at the 9:30 Club, when she was out here touring with her mates Laura Marling and Johnny Flynn. She held both of my hands excitedly. “You must come see us tonight. I have a brand new band!” How could I refuse? Again, I had thought that I’d arrive with the latest set at the BME in full swing, but that was before I saw how much gear she and her band were trying to set up on Latitude 30’s stage. After an emotionally graceful album like her debut ‘We Slept at Last’, ‘Boyfriend’ comes as across as a jarring, yet liberating moment. Its lo-fi drawl is further enhanced by on record and live – wait for it – London girl group The Big Moon as her backing band! Either Marika thought I knew, or she wanted it to be a surprise. If you read my interview with her 2 years ago, she explained to me her massive respect for Laura Marling and what walls she broke down for the women who came after her. Given that she had once told me how tentative she felt sharing her music, it looks like from the acres of fun she and her band have onstage, her upcoming sophomore album for Sub Pop, ‘I’m Not Your Man’ out the 2nd of June, will be showing the real Marika Hackman, warts and all. A woman who’s comfortable in her own skin is a wonderful thing indeed. It’s funny that Hackman is now with Sub Pop, as the next artist I chanced across at the Swan Dive Patio is on the same label. 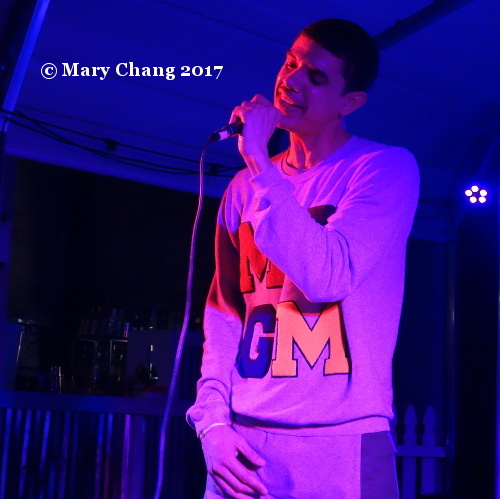 Porter Ray (surname Sullivan) is an American up-and-coming rapper who I learned from my research is part of the underrated Seattle hip-hop scene. He came to Austin to promote his long-awaited debut album ‘Watercolor’, released the Friday before SXSW. Of course with Nirvana and Pearl Jam, the Northwest city famed for its dreary, rainy days is most famous for its responsibility in kickstarting the ‘90s grunge scene. Is he the first of an upcoming rap division in Sub Pop’s otherwise indie arsenal? I couldn’t tell if his less than energetic stage presence had to do solely with his subject matter (his brother was killed by gunshot) or if he was just really, really nervous. While I’m no expert on rap, I could appreciate the higher pitch of his voice, unusual for a genre where darker, deeper, menacing voices are preferred and tend to prevail. After negotiating the badge queue, I finally got in to find myself in the midst of Kate Nash’s coronation, practically. Maybe I shouldn’t have been surprised how mental people in the venue were going, given her debut album ‘Made of Bricks’ is celebrating its 10th anniversary this year and she’s inspired countless young girls to greater things. I stepped way back from the stage to let the uberfans get closer to their idol, churning through hits like ‘Mouthwash’ and ‘Foundations’. Even from afar, I could see sparkly stripts of things, fishnets and fuzzy pink balls all over Nash’s body. 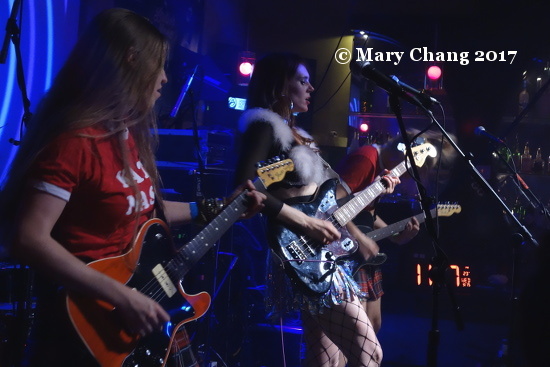 At least for that hour at the British Music Embassy, it was Kate Nash’s world. 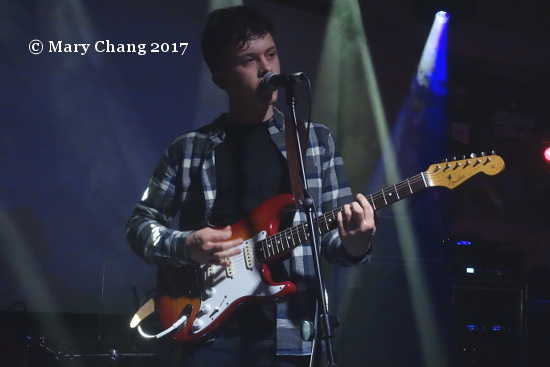 My final act for Wednesday night would be Ten Tonnes, aka Ethan Barnett, who wowed me at the Culture Collide / Twix showcase at Bar 96 that afternoon. He would be the second to last act on the BBC Radio 2, PPL, and PRS for Music showcase. Compared to that fireball Kate Nash before him, his set was conservative, bringing things back to the music. Dressed in a plaid shirt – it was an evening show after all, right? – there was something so sweet about his set. I realised he reminded me of a dear friend, before he and his band became famous. Here we were, presented with the two extremes in performance in music today, an industry veteran with all the bells and whistles followed by an up-and-comer with nothing but his voice and guitar. The fact that both of these can live in harmony in our industry, neither getting muscled out by the other, should give us all hope that the business can sustain not only established artists but nurture those coming up. Laura Marling made big waves back in the spring when she released her fifth album ‘Short Movie’, which was recorded out in Los Angeles when the otherwise normally London-based singer/songwriter made a temporary escape to America. Despite her young age – she’s only 25, though with a back catalogue like hers to be proud of, she seems so much older – her music has already undergone significant change from her earliest appearances as a backing vocalist on Noah and the Whale‘s debut album ‘Peaceful, the World Lays Me Down’ and her first solo album released in 2008, ‘Alas, I Cannot Swim’. With ‘Short Movie’, her music seems even more honest than before, and she’s also chosen a harder edge that she’d only begun to explore in the 2013 Mercury Prize-nominated ‘Once I Was an Eagle’. Keeping in mind this evolution in style, it became apparent after talking with fans in the queue outside the 9:30 that the “new” Laura Marling had mixed reviews. Having not seen perform since 2011, I was keen on seeing how her live performance had changed in 4 years. Along for the ride with Marling on this North American campaign are her musical friends Marika Hackman and Johnny Flynn, the former describing in a chat with me before the show that their friendship has made this journey out to our continent fun and stress-free. Hackman was up first Friday night and although she’s not well known in America – yet – the general consensus with those I spoke to after her set was overwhelming positive. Wearing what she described as her pajamas because she hadn’t packed well for the oppressiveness of American summer (the high for DC on Friday was 92 F, or 33 C), she apologised for wearing a t-shirt and mens’ boxer shorts, while also telling all the young girls in the audience she should take her lead and make the fashion trend stick. Her stage banter was funny and disarming, a theme that was repeated in both Flynn and Marling’s own sets. However, when it came down to the actual performance, Hackman’s fragile, emotional voice and adept acoustic guitar playing went down a treat. She released her debut album ‘We Slept at Last’ on Dirty Hit Records back in February, and the beauty of songs being sung and played with such sensitivity, which included early LP single ‘Drown’ and my personal favourite ‘Ophelia’ reverberated through the club. Her cover of American Joanna Newsom’s ’81’, which features on her ‘Sugar Blind’ EP released in 2013, was equally gorgeous. For ‘Animal Fear’, Marling’s bass player and drummer came onstage to accompany Hackman, the resulting sound and rhythm getting punters’ head bopping. It’s not too hard to imagine this talented singer/songwriter gracing this stage as a headliner sometime soon. For more on Marika Hackman on TGTF, go here. Singer/songwriter and now also actor Johnny Flynn was next, and judging from the screaming and squealing from the girls and women in the crowd, security placed a barrier at the front to deter his devoted fans from scrambling onstage. While Flynn’s deep voice live surprised me, there wasn’t a whole lot about his set that grabbed at me. Also, his voice got drowned out by those around me who were singing along loudly (more power to you, I guess, but it was really distracting). A duet with Laura Marling on ‘The Water’ was recreated live, much to the delight of the punters. Having several albums to his name, he smartly took a trip through his back catalogue, including standouts ‘Brown Trout Blues’ from 2008 and the title track of 2010’s ‘Been Listening’. He ended his set on a high note, enlisting the help of Marling’s backing band and both the voices and hand percussion talents of Marling and Hackman on ‘Tickle Me Pink’. Needless to say, his foaming at the mouth fans would have preferred for him to have played longer. For more on Johnny Flynn on TGTF, go here. Then it was time for the main event. I still have trouble getting over her short-cropped haircut (I asked myself when I saw her at SXSW 2015, “where are her long blonde locks?”) and while I realise it’s been a long time since I saw her play in 2010 in the very intimate Iota, it’s still jarring to me that she’s all grown up. Marling was always mature for her age, and on ‘Short Movie’, it sounds like she’s sharpened her resolve to be her own person and to write and sing about what she wants, and with the emotions on full display. I find it hard to listen to Marling’s more recent work, and this proved also true when I was faced with her live Friday night. This is not criticism of her talent, of which we all know Laura has loads of; it’s more a commentary of the rough-edged, straightforward and therefore often strident way her music comes across these days. There’s no more contrast you could have than Marling performing the relationship-weary ‘I Was an Eagle’ from her 2013 album alongside the sweetness and naivete of ‘Alas, I Cannot Swim’. The evolution of Marling’s music includes bluesy bents evident in ‘Walk Alone’ and discarded ‘Short Movie’ track ‘Daisy’, the latter of which has the fantastic line “a woman alone is not a woman undone”. Like Joan Baez and Joni Mitchell before her, Marling is forging her own way in this world, and there needs to be more artists like her who aren’t afraid of being honest. After the cut: Laura Marling’s set list. To read more on Marling on TGTF, go here.